The name comes from the words “Jollibee” (the popular Philippine fastfood chain) and “Jeepney” (the Philippine mass transportation). 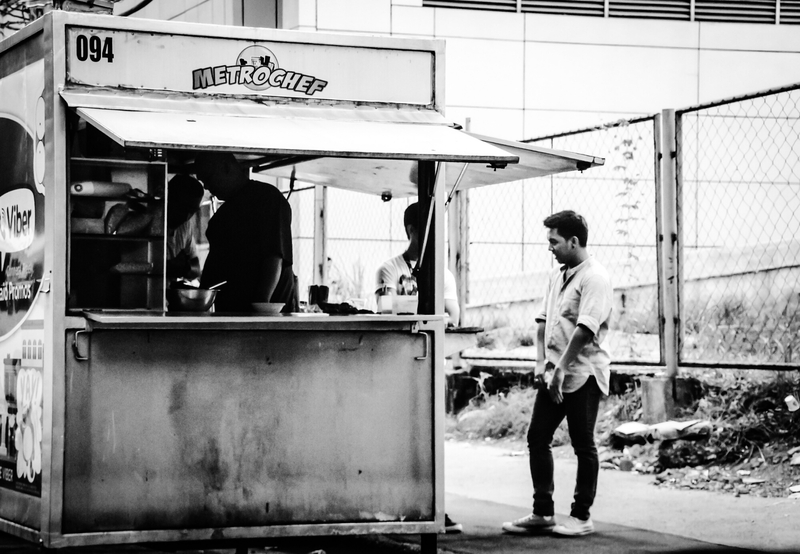 The famous “Jollijeep” is a familiar metal cubes on wheels along the side streets of Makati Central Business District. Jollijeep offers food that are much cheaper and with more variety for breaksfast, lunch and snacks. With less than 50 pesos (US$1) you can get a full meal with a rice, one viand and a desert. This is where you can see long-sleeved and high-heeled employees eat standing (because it doesn’t have any table or chair). Here you have to eat quickly to make a way for the next hungry person. They serve your foods in paper plates, plastic utensils or anything that minimize the dish-washing. Idiotisitis: A Highly Communicable Disease! Hello Mr. Ompong. 🙂 I’ve seen this jollijeep whenever I am researching for my food truck feasibility study… and there’s not much articles regarding jollijeep. May I know when this jollijeep started? great solution for an economic and quick meal, standing room. i suppose they are close when it pours. soup kitchens are also trending in kl now, ompong. I figured Filipinos are the only ones who uses that term “viand”. I just came from an expensive lunch and I wasn’t too happy with it. I could have been happier with a mami and siopao from the stand or a tapsilog. Sometimes these food stands have the absolute best food in town, same thing in the States, but some may not agree with me on this. One of our breakfast places we like uses paper plates, plastic utensils and such, I am sure to minimize the work and cut overhead costs. The owners are fantastic people and may be from your country too, not sure. Best waffles in Las Vegas! pardon my stupidity – what is a viand?